Home / Deals / Online Deals / Taste Guru: FREE Gluten-Free Box! Just Pay $12 Shipping! 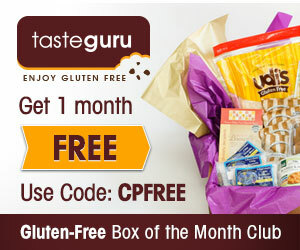 Sign up with Taste Guru and get your first gluten-free box for FREE! Just pay $12 shipping! Use code CPFREE to get this deal!Taste Guru is a monthly service that sends you a box of great Gluten-Free food each month! Save money plus get introduced to new Gluten friendly brands you may not have ever heard of otherwise. See below for an example of what comes in each box! Tons of great stuff and some brands you probably already know and love! So if you are totally gluten-free, or are looking to try, check out this deal and get your first gluten-free box from Taste Guru for FREE All you pay is shipping of around $12 which is still an awesome deal!!! Flag Print Scarf only $9.95 + FREE Shipping!